This book explains how companies bill for IPTV video, telephone, data, and information services. Billing and customer care for IPTV systems convert the measured amounts of services (bytes of digital information transmitted or information services provided) within an Internet Protocol (IP) data network into the money that will be received by the service provider. 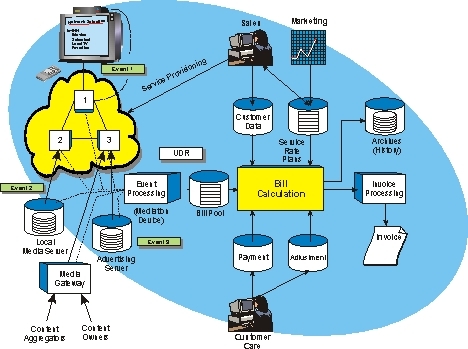 This figure shows an overview of a billing and customer care system that is used for IPTV services. In this diagram, the sales department or an activation agent works to establish a new IPTV service account. The agent (customer care) enters the customer's service preferences into the system, checks for credit worthiness, creates a work order to send or setup customer premises equipment and provisions the network to allow the customer to access and view services. This example shows that the activities of the customer (such as requesting a television show) result in the creation of multiple event records. These event records are combined into an event detail record (EDR) that is provided to a bill pool. Periodically, the bill pool is reviewed and all the EDRs for the customer are gathered for specific time period. The billing system uses rate plans to perform bill calculation and payments and adjustments for the customer account are applied to create an invoice. History (archive) files are then updated for the use of customer service representatives (CSRs) and auditing managers. 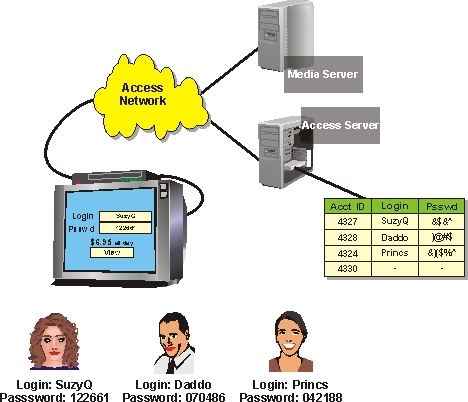 This figure shows how it is possible for multiple accounts to be serviced by the same access device (such as an IPTV set top box in this example). This example shows that a television is shared by three roommates who each have their own IPTV account. Each user uses an access code each time they want to obtain access to premium content. The billing system is able to differentiate between users based (account ID) on the login access code rather than the unique network address of the physical device. Mr. Lawrence Harte has over 29 years of experience in the electronics industry including company leadership, product management, development, marketing, design, and testing of telecommunications (cellular), radar, and microwave systems. He has been issued patents relating to cellular technology. He has authored over 75 articles on related subjects and has been a speaker and panel moderator at industry trade events. Mr. Harte earned executive MBA at Wake Forest University and received his Bachelors degree from University of the State of New York. During the TDMA digital cellular standard development process, Mr. Harte served as an editor and voting company representative for the Telecommunications Industries Association (TIA) TR45.3, digital cellular standards committee. As of 2003, Mr. Harte had authored and co-authored over 50 books relating to telecommunications technology. He has served as a consultant and expert witness for leading companies including Ericsson, Siemens, VLSI, AMD, Casio, Samsung, Sony, ATT, Nokia, Hughes and many others. The billing systems used in IPTV systems can vary from modified television billing systems to custom integrated systems that allow real-time (near instant) activation and prepayment of services. The authors have interviewed and worked with hundreds of service provider companies and billing system developers to discover the ways IPTV billing systems operate. You will learn the language and terms used in the setup and operation IPTV billing system systems along with the format and important information parts of event detail billing records. The popular billing industry standards used to track IPTV services include IPDR, AMA, CIBER, TAP and XML. Covered are the basic processes used to assign costs (rate) to the usage of transmission and information services. Discussed are the ways that charges can be settled between service providers who allow visitors to use their systems. Included is a basic introduction to how services can be instantly provided and how billing is performed for access to information services. You will learn how mediation systems adapt usage events into billing records that can be gathered, combined and managed by billing systems You will learn how IPTV systems identify specific users and how to guide billing records the appropriate customer account. The rating processes used for different services provided by IPTV are explained. You will discover that a typical usage transaction look like, what elements are needed to create a usage record, how to deal with un-ratable records and rating usage from service partners. The process of invoicing is covered including billing cycles, invoice creation and posting to customer accounts. You will learn how it is possible to manage multiple user accounts on the same IPTV set top box (STB). Taxation issues are discussed including jurisdiction and other regulations along with universal service funds. Service rates and discounts are described including volume discounting, multi-tier discounting, bundled rate plans and service adjustments. You will learn how IPTV systems permit customers to self provision services and the common payment options that may be available to the customer.